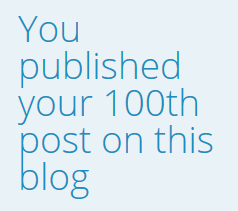 Knowing like I know that there are plenty of bloggers out there who publish daily and/or have been longer at it and who must be so far beyond their 100th blog post they can’t even see it with a telescope on a clear day, still I can’t keep from wondering how I made it this far. Publishing twice a week worked for a while. I would have loved to publish more often but felt I would never get away from my blog if I went down that road. Blogging impressions: when is a blog post ready? A while ago I decided two blog posts per week was too much while I was getting used to my new job. Now, I’m not so sure. Publishing just one post per week just doesn’t feel right. Especially because it allows me to not log on and write every single night. On the other hand, I needed some evenings off blogging. I still do. What do you reckon: should I blog – or spend time with you guys? A curious side effect of not sitting down to write every day is that I’m suddenly faced with a decision I need to make every day: do I sit down to write today – or will I wait until tomorrow? Chances are you’ll end up saying something to your other half – or to your kid(s) and they’ll say: “well, then, don’t blog if you don’t feel like it.” How much will you feel like blogging after that type of encouragement? I’m going to publish two posts per week again – whenever I manage to do so. If I don’t I’ll publish one post on Monday. I’m not yet sure if the other one should be on Thursday or Friday – what do you think is a good day for posting? Whether I’ll be able to produce a quality blog post every time I have yet to find out. And there’s just one way to find out. Stop whining. Start blogging. When is a blog post ready? That’s my main reason for wondering if I’ll be able to publish twice a week. I’ve often felt uncertain about just writing and hitting ‘Publish’. But editing can lead to overediting – and take up way too much time. So I’m going to be hard on myself and just publish this. After I get a picture somewhere that suits this blog post – and possibly my sense of humor. And finally a reading tip for you that is similar to one of my earlier posts – only this one is from Weblogbetter.com: Why do you blog anyway? Enjoy! It’s been an interesting year that started with wanting to write. Passwords. Everybody needs them, but only few of us like them. A password will guard your online belongings when you’re out so nobody will come in to burn your frying pans, empty the fridge, swim in your pool, and invite all their friends over to the party they’re planning in your garden. But having to make one up and remember it is as much fun as remembering to lock your front door. How do you create a strong password – and remember it? While I’m hoping everybody got themselves a decent password after hacks into LinkedIn and Twitter a while ago, you may not have mustered the courage to come up with a really strong password. Or you did, and ended up forgetting your brand new password within days. Summer has finally hit the shores of the Netherlands and elsewhere too I dare say. Like I announced earlier I’ve changed my posting routine to once a week at least for now. Great summer image by Christine Majul. Click to view on Flickr. To make sure I don’t end up neglecting my blog over the summer, I’ve thought of a couple of easy tasks that’ll make any blog better than it already is. Are you ready? Check for old posts that you wrote in a hurry. Think of topics that might have turned into a great post but didn’t quite make it because you were tired or stressed out. Open the curtains and let the sun shine into those old winterdepressed writings. See if which of your old ideas, posts and drafts alike, deserve some high summer TLC from you and start editing, rewriting, and (re-)publishing. If you post one new blog post once a week, update another post every week or so. This is definitely an issue for some of my posts and I think it is the nicest way to update old posts. There must’ve been times when you just didn’t have time or energy to look for the best possible images. Change images you added which you don’t like anymore – images that don’t fit in with the rest of your blog. I can’t think of a nicer way to improve your blog than looking for really cool pictures that’ll make your (old) posts look 10 times better. Look for great images to grace your future posts while you’re at it. This also means tagging the new images. Focusing on just the images on your blog for a change means you can ‘SEO’ your images as much as you like by adding keywords from your text to the alternative text box (Alt tag stuff), description, and title. This is what turns an image into visual content, apart from its contribution to your written content. What topics and posts have been really popular? Do your popular posts stand out in particular ways, like quality of images, truly inspired writing, or seasonal flavor? Have people found you through search – if so, what were they looking for? The important thing is to remember it’s summer. Don’t beat yourself up if you find you could have done a better job for some posts. Summer is a great time for good intentions. Start by taking a relaxed view of your blog posts – then take them out for a brisk run in the summer breeze. How much did you write when you started blogging? Apart from if you’re actually a professional blogger, what’s the use of having a blog? Why would you want to blog at all? Because you enjoy writing (or making videos, in case you’re into video blogging). Because you don’t mind (or love) the attention. Because you don’t mind the kind of work involved: writing, getting or creating pictures or videos, making sure your content is properly tagged so people who don’t know you will still find you by searching for the topics that are on your blog. Because you need a portfolio. You need to create content for whatever purpose. Even if you don’t start blogging for that purpose, posting fresh content on your blog will eventually build a portfolio of your content. What would you like to do with it? Why would you want an online portfolio, and of what? That you can write – in a language of your choice. (In my case I might have written in Dutch, but I chose English instead). That you’re able to create content to a schedule. That may mean posting daily, but it doesn’t have to be that intense. Once a week can be enough. Keeping it up for any length of time and consistently producing good or at least acceptable (although you should aim higher) content costs time and energy. Can you keep it up and still enjoy blogging? That you’re able to build a community around your blog. You may do so on your blog, or off – I know people who have little interaction on their blog, but much more on Facebook. In my case, readers react on my blog, on Twitter, or on LinkedIn. And of course depending on what you blog about, they’ll get some idea of you as an expert on one or more topics – and as a person. What kind of portfolio is your blog turning into – and could it support your chosen career?